The Goglory Sports is a home game manufacturing company based out of Kent, Washington. Their company focuses on designing and manufacturing quality home recreational games for families of all ages. Their product line includes billiards, table hockey, foosball and multi-game tables. 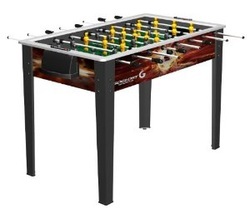 Their foosball line currently features 3 tables on the market today. The 56 Inch is a full size table that is built for adults. This table features higher quality parts at a higher price point. The 53 Inch and Playmaker are smaller tables intended to be used by kids.